The scene action occurs inside the camera frame, so it’s really important to set it up correctly. You can adjust the camera resolution and other parameters in the Scene Settings window—see Scene Settings. The Camera layer is static which means that if you need to animate it, you must add a peg—see Animating the Camera. You need to add a camera layer to your scene, so you can edit the camera frame. You can only see one camera at a time. If you add several cameras to your scene, you can use the Camera list to select the active one. You could use this feature if you are still working on your scene composition and have different camera framing to try out. You can reposition your camera frame directly in the Camera view, using the advanced animation tools. Another way to set up your camera frame is to type the coordinates directly in the camera's properties. Doing this positions the camera precisely where you want it to be rather than gauging it visually—see Positioning an Element Using the Layer Properties View. ‣ In the Timeline view, click the Add Layer button and select Camera. ‣ From the top menu, select Insert > Camera. NOTE: You cannot add a camera inside a symbol. From the top menu, select Scene > Camera > the desired camera. If you only add one camera to your scene, you will only see Default Camera in your list. ‣ From the top menu, select Animation > Tools > Translate. ‣ In the Advanced Animation toolbar, click the Translate tool. ‣ Press Alt + 2. 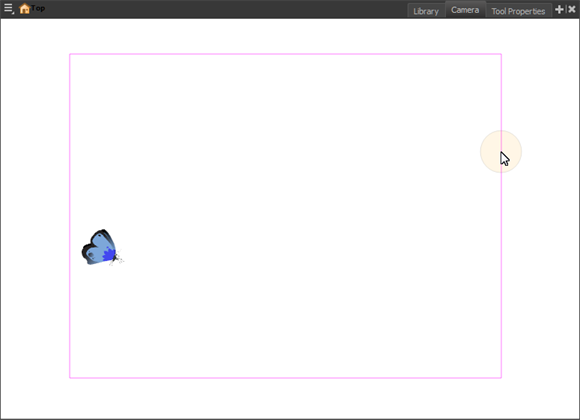 In the Camera view, click on the camera frame (thin rectangle) to select it. You can also select the camera layer from the Timeline view. The selected camera frame is highlighted. Drag the camera frame to a new position. ‣ From the top menu, select Animation > Tools > Rotate. ‣ In the Advanced Animation toolbar, select the Rotate tool. ‣ Pres Alt + 3. In the Camera view, drag to rotate the camera frame until it reaches the desired rotation angle. In the Layer Properties view, adjust the camera's properties. Enable/Disable Turns the camera layer on or off. Change Track Colour The Change Track Colour button lets you change the colour of the exposed frames; this helps you to quickly locate a layer in the Timeline view. Click the Change Track Colour button to open the Select Colour window and choose a new colour. You can modify the colour for any type of layer, such as group, peg, drawing, and effects—see Changing the Layer or Column Colour. Name Displays the current layer name. You can rename the layer by typing in a new layer name. Position Displays the current position of the camera layer using X-axis (East/West), Y-axis (North/South) and Z-axis (Forward/Backward) coordinates. To reposition your camera frame, type in the new values corresponding to the desired position coordinates. You can also use the up and down arrows to set the value of each field—see Positioning an Element Using the Layer Properties View. Angle Displays the current rotation value. To set a new rotation position, type in a new angle value. 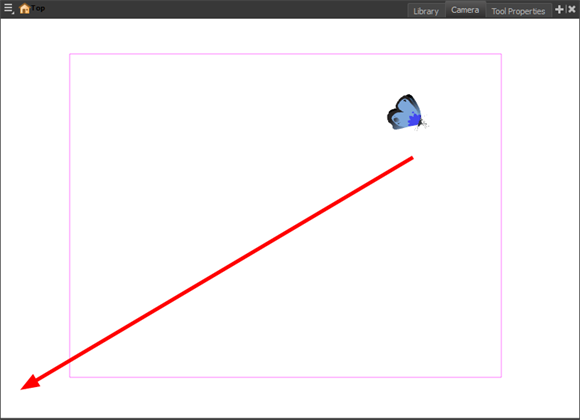 You can also use the up and down arrows to set the new angle value. Pivot Displays the current position of the rotation pivot of the camera layer. The camera will perform a rotation taking the position of the pivot as its angle centre. By default, the pivot is set at the centre of the camera frame. 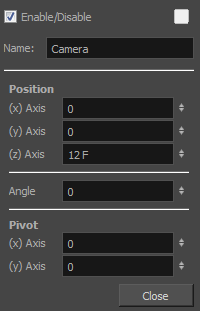 To reposition the pivot point, type in new X and Y coordinates values in the appropriate field. You can also use the up and down arrows to set the position values. 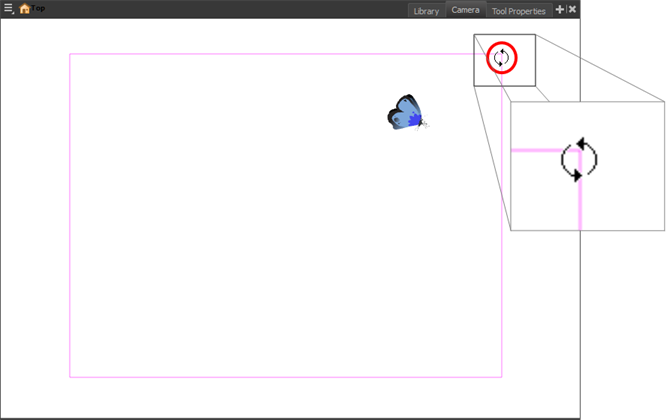 In order to see the pivot's position you will need to have the Rotate tool selected. In the Timeline or Camera view, select the camera layer.